Perhaps she already had some hope for the future. Queen Victoria certainly already saw the future quite clearly – Mary should marry the next heir, Prince George. On what would have been her wedding day, Mary visited the Wales family. She wrote in her diary, “This day is a very sad one for me for it was to have been our wedding day. Es wär zu schön gewesen, es hat nicht sollen sein.1 Afterwards the family travelled to Cannes where Mary’s spirits were revived. While there, they were visited by the Wales family and Prince George spent a lot of time with them. Mary and her parents travelled all over Europe and Mary was reluctant to return to England. They did not return until July 1892. At the end of the year, the family went to stay at Sandringham with the Wales family. At Christmas, Prince George sent Mary a brooch. In a simple dress of white and silver and small lace veil also worn by her mother on her wedding day, Mary married George at the Chapel Royal of St James’s Palace. 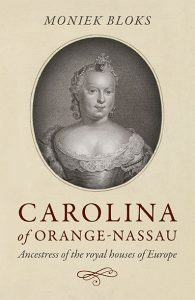 She was now the Duchess of York. For their honeymoon, they went to York Cottage at Sandringham. They had received the cottage as a wedding present from the Prince of Wales, and they would live in it for 33 years. Mary soon found herself pregnant, and she awaited the birth of her first child at her parents’ home at White Lodge. She gave birth to a son on 23 June 1894 at 10 p.m. It was the first time in the United Kingdom that there had been three direct heirs as well as the sovereign alive. The baby was named Edward Albert Christian George Andrew Patrick David and was known by the last of his names. Until 1901, Mary and George were almost living in a shadow. Since the Prince of Wales was not allowed a role in government, neither was George. They performed a limited number of engagements, and George was all too happy as a country gentleman. 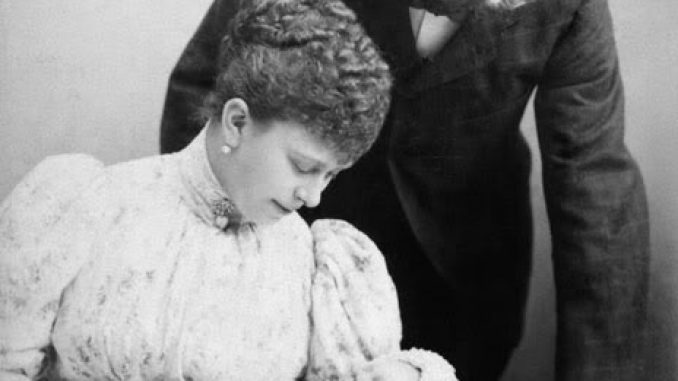 On 14 December 1895, Mary gave birth to a second son, Prince Albert. He was born on the anniversary of the Prince Consort’s death to George’s horror. Queen Victoria later wrote to the Princess Royal, “It is a great pleasure to me that he is to be called Albert but in fact, he cld hardly be called by any other name.” On 25 April 1897, Mary gave birth to a daughter also named Mary. The year ended on a sad note when Mary’s mother died on 27 October 1897 after an operation. Mary wrote to her aunt, “It seems impossible to realise that darling Mama, of all people in the world, so full of life & happiness, should have left us, it is awful awful & I dread to think of how we can live without her – For Papa it is cruel & his sad state makes it so much worse, he was so dependent on Mama for everything & now God knows what he will do.” Her father lived on for another two years in seclusion at White Lodge. He died in January 1900 with the Princess of Wales writing, “Poor Franz Teck’s death is a happy release for him & he has virtually been dead to us for nearly two years!” Mary was heavily pregnant when her father died, and on 31 March 1900, she gave birth to a third son named Henry. victoria of the united kingdom.